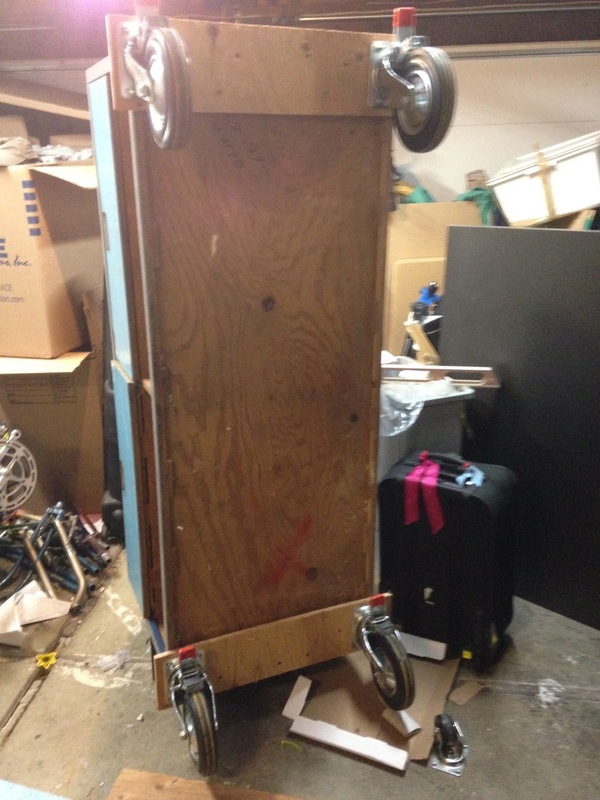 DIY Biking | How bike builds, bike travel and bike life can save the world: Moving to Silicon Valley: Part II - Where Do I Park the Park Tool Workstand? 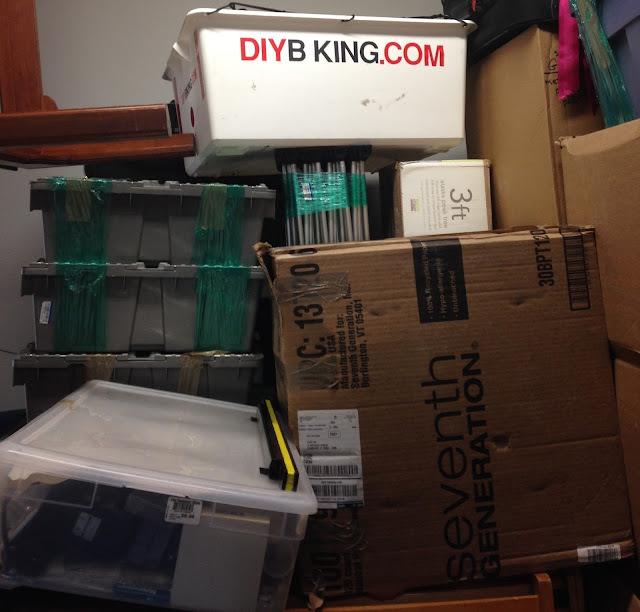 Moving to Silicon Valley: Part II - Where Do I Park the Park Tool Workstand? You never realize just how much stuff you’ve acquired over the last ten years until you see all of it delivered to your house inside of five hours. I was thankful I had painted the walls of my new bike workshop in Silicon Valley before my stuff arrived because when it did I couldn’t even see the walls. Boxes were piled as far as the eye could see…and you couldn’t see more than five feet in any direction for quite a while. When unpacking, I quickly discovered two things: first, the movers in Connecticut had wrapped everything in paper, which meant that each empty box would produce various items and an equal volume of paper that had to be dealt with. 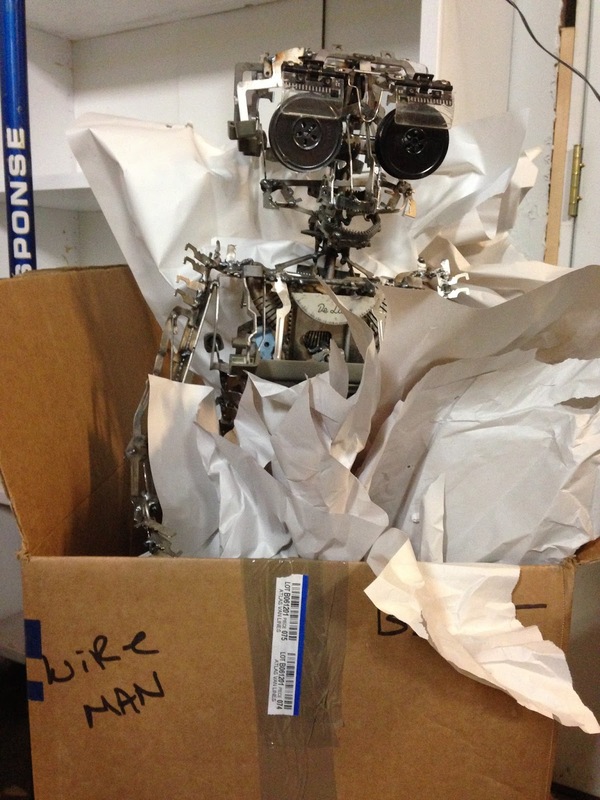 Secondly: I think the Connecticut movers got disgusted, bored or both and just labeled most of the boxes from my workshop ‘Bike Parts/Miscellaneous.’ Occasionally they renamed some of my unsold artwork. But I’m off the subject. The first thing I needed to establish was a place to put bike tools and work on a bike. As I discovered during my brief stay in Mountain View: my PCS-9 was mistakenly left out of the ‘early out’ container so I felt as though I hadn’t fixed any of my bikes properly in months. I also knew that my recumbent - which, of course, was in a warehouse somewhere instead of riding in the Five Boro Bike Tour this year - and Budget City Bike were arriving. They both had been in storage for two months and I wanted to get them back on the road as soon as possible. Happily, one of the first boxes I opened contained my Park Tool PCS-12 work stand with a workbench mount…but I had no place to mount it. Before I left Stamford, I hatched a plan to use an old cabinet my dad got from the retailer G-Fox as a bike work stand: I attached the PCS-12 to the top of a rolling work stand meant for a car (where it could be raised and lowered at will) and all of my tools would be in the drawers near my knees. It would also help keep the shop clean since dirt and grime would land on a piece of paper spread on the cabinet and not the floor. The G-Fox cabinet had 2” casters on them but the seams in the concrete of my garage floor meant they’d get stuck all the time. Lucky for me I found all four of my 8” Mutant Giant Caster 3000s (or whatever the brand name is) from my ill-fated laptop stand project and set about attaching them. I barely had any room to turn the cabinet on its side, but I just about managed it so I could attach the casters to scrap plywood. I had to use the drawers of the cabinet to make a crude workbench. 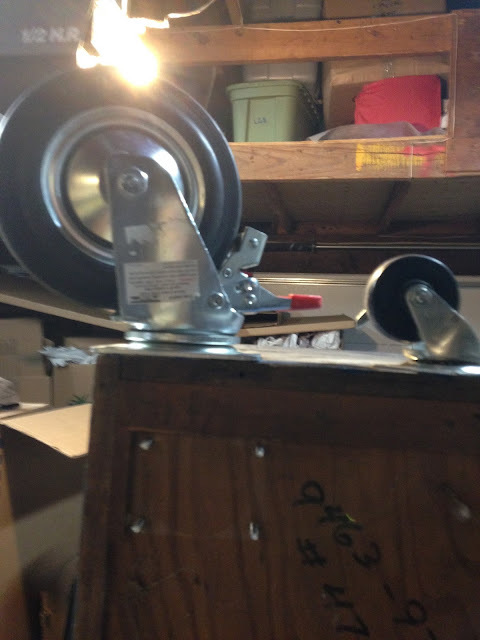 Since my hand power tools were in the car when my wife and I did our nine morning drive from Connecticut to California, I was able to attach everything without too much trouble…and realized just how big the casters were. After gently placing it on the ground, I enjoyed putting things in the drawers. When you move across the country and every box is labeled the same and your big bookcases won’t even fit into the new home office it is nice just to put things away. 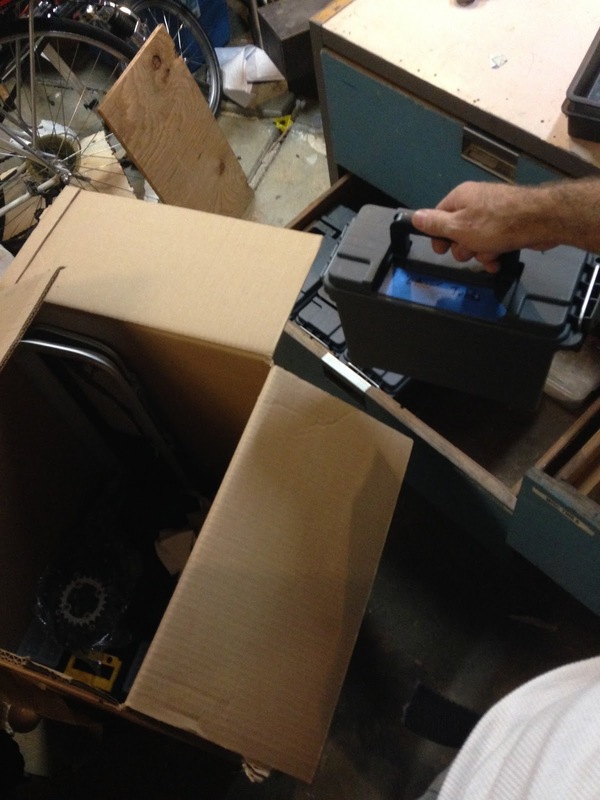 I like these little $6 ammo boxes from Harbor Freight Tools to put parts and tubes for specific bikes inside. I added a Thule fork mount to one side of the bench in case I ever wanted to secure bikes there - it also makes a convenient handle for dragging the workbench around. 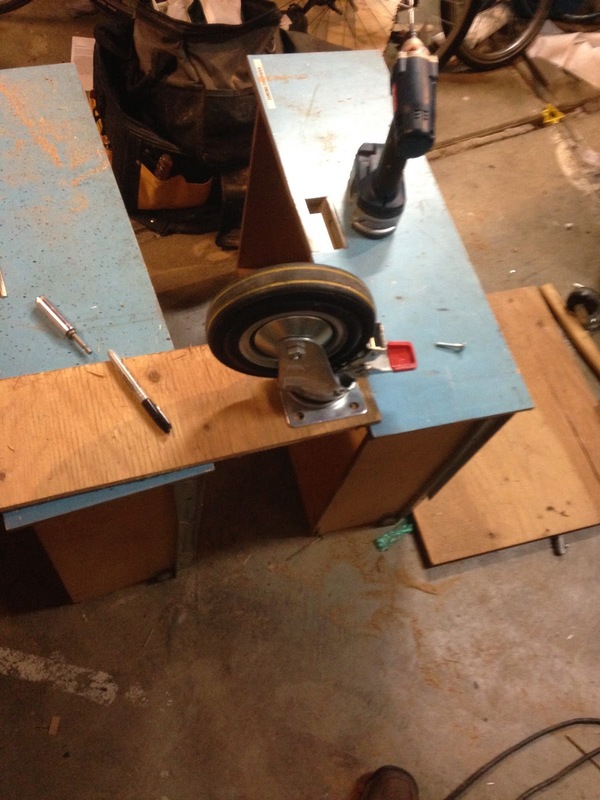 I reattached the arm topped with the PCS-12 to complete the new bike workbench. 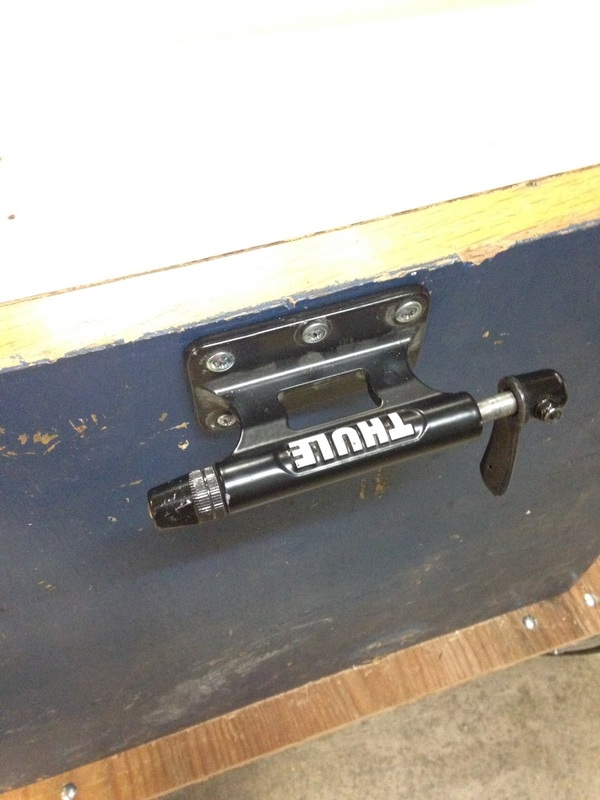 Now all of my bike tools have a place to go and any bicycles on the PCS-12 would be just the right height for me to service them. Of course, I had to keep up emptying boxes…and discovering parts of the 304 and other things that just had no place to go yet. So they went on my new bike work stand cabinet. But it’ll be used for its proper purpose soon enough...as soon as I can find all the bike tools. Thanks for reading and thanks for riding. Thanks for sharing your story on Moving to Silicon Valley. 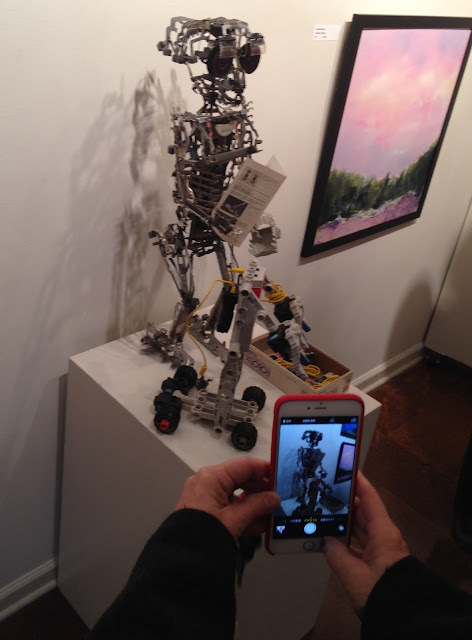 I like the rebort pictures most because i am also liking technology like biking and much more.I see some reviews on a website regarding this, You can check it out here. If you have an aluminium bike you can easily pack in a single box from carry it to another place because they have low weight. You can read more regarding biking packing supplies on amazon.